Sorority recruitment is a VERY unique experience. You will likely never experience anything like this again in your life, even when you finish college and look for a job. In recruitment, you are in a new environment, with new people, feeling possibly overwhelmed, likely nervous, and out of place. You get one chance to get it right. You need a plan. Hello! 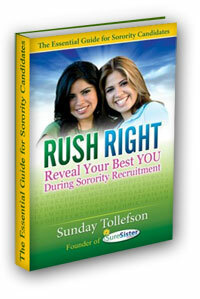 My name is Sunday (Yup, it's my real name), author of RUSH RIGHT: Reveal Your Best YOU During Sorority Recruitment. I've coached hundreds of college students all across North America get into the sorority of their dreams. Students who prepare for sorority recruitment always do better than those who don't prepare. So you're already on the right track! Scroll down to check out the contents and then enroll for FREE in the mini-course to get started! "Thanks again for your help - my daughter knew what to expect and used several techniques from the book. Just wanted you to know that my daughter pledged Kappa Kappa Gamma at the University of Oregon this week! It was the sorority my mother belonged to, so has special meaning for our family, and grandma is thrilled." PS: Got questions? Connect with me on Twitter, Instagram, and Facebook! Congratulations! You want to join a sorority. Are you NOT a "stereotypical" sorority girl? Are you participating in a highly competitive sorority recruitment? You will have greatly reduced nervousness and anxiety during sorority recruitment. You will clearly understand your strengths and how to talk about those strengths in a non-conceited way. You will clearly understand what your worries and weaknesses are and how you can overcome them. You will understand the nuances and intricacies many women miss which are important to making a good impression. You will combine talking, questioning, and listening to craft a mature, productive conversation. You will know what to wear, what not to wear, what they'll ask, and what to ask them. You will understand how you can make good use of your recruitment counselor instead of treating her like a tour guide. You will have a set of new skills that will help you understand how to position yourself, communicate effectively, and make a specific type of impact on any decision-maker you meet. You will find you form friendships faster and can determine the chapters where you will have the most success and enjoyment as a sorority member. You will enjoy meaningful friendships in your sorority because you have chosen the best sorority. You will be able to put your best foot forward by identifying in advance your strengths and weaknesses. You will be prepared to effortlessly promote yourself with just a few comments. What does this mean for you? You will be more confident and less nervous; you will come across as mature, intelligent, interesting, attractive, and self-assured—characteristics every sorority desires in its members. You will easily engage people. Thank you for believing in yourself and for giving yourself this opportunity. Let's get started! Enroll in the free mini-course now. No commitment required! SURPRISE! PRIVATE sorority recruitment community. Open for the link! What happened? Share your story!